Disclaimer: As a member of the Vicks® Ambassador Network, I will be sharing stories and tips related to their products and have received compensation. As always, I believe in honest storytelling as it relates to working with brands, and the opinions expressed in these posts belong to me and aren’t influenced in any way. We are smack dab in the middle of a brisk cold and flu season. Womp womp. No one likes to get sick. But when you are a busy working parent and have so much on your plate at one time, the cold and flu are two of the last things you want to have happen to you. With so much on our schedules, the moment we begin to feel a “cough coming on”, we scramble to find the best solution so we can still be the parent, the employee, the chauffeur, the cook, the referee, so on and so forth. What if I told you that are many things you can do to help you power through the cold and flu season so you can get through your day? Know the signs. You are most contagious in the first 24 hours when your symptoms are at their worst. If you have two or more of these symptoms, stay home to rest: fever over 101o F, cough, sore throat, running nose, headache, body aches, chills, or fatigue. Avoid germs at work. Watch out for these germ-ridden places at the office: the sink in the break room, the office microwave, and doorknobs. Keep antiseptic wipes with you and remember to wash your hands frequently. Say no to stress. Stress can influence the symptoms of cold, cough and flu by interfering with how the immune system functions. To keep your immune system strong, make sure to get plenty of rest and sleep all the time, not just when you’re sick. Try tea. Drinking an herbal tea such as chamomile, passionflower or other soothing teas before bed can help you relax while also getting helpful fluids into your system. Take a multi-symptom medication. My patients want fast, effective relief to help them get back to their busy lives. Look for a medication that can treat the toughest symptoms while also helping you rest. DayQuil Severe and NyQuil Severe fight your worst cold & flu symptoms so you can power through symptoms during the day, and get the rest you need at night to get back to being you. If you do get sick, Nurse Barb recommends over-the-counter medicines like Vicks DayQuil Severe and NyQuil Severe, which offer relief for a multi-symptom cold or flu. They both include maximum strength ingredients to help relieve even the worst symptoms. Vicks DayQuil Severe offers non-drowsy relief so you can power through your day, and there is no other non-drowsy medicine that relieves more symptoms—no other nighttime medicine relieves more cold/flu symptoms than NyQuil Severe. Whether you need relief during the day or night, DayQuil Severe and NyQuil Severe both provide relief for your WORST cold symptoms. And what’s better Vicks DayQuil and NyQuil Severe was voted the Best New Cough & Cold Remedy product by The Better Homes and Gardens Best New Product Awards (BNPA), the most credible, consumer-voted awards program in the U.S. in an independent survey of over 70,000 American consumers. 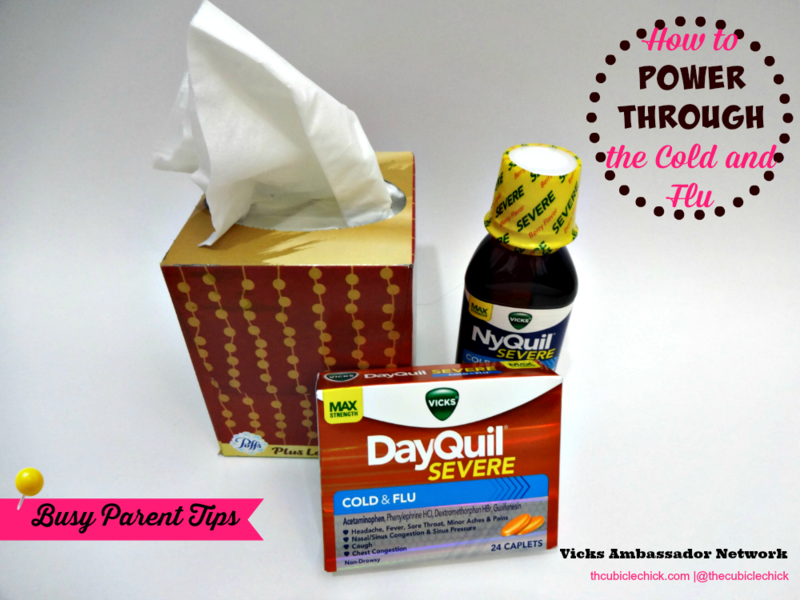 Make sure to keep Vicks DayQuil and NyQuil Severe on hand to help you power through the cold and the flu. I’ve got mine ready, just in case. You can get more information about these and other Vicks® products by visiting Vicks.com. Get helpful tips on their Facebook page: https://www.facebook.com/NyQuil.DayQuil.